Equifax Credit Information Services Ltd became the second credit bureau of India to offer a credit score. It was launched on Thursday and is called “risk score". Earlier, Credit Information Bureau (India) Ltd (Cibil) was the only bureau which provided credit scores which it started in April. Experian Credit Information Co. of India Pvt. Ltd, another credit bureau, offers a credit report but not a credit score yet. “The risk score is designed to predict the likelihood of a customer defaulting over the next 12-month period. An account is said to be a default when it crosses the 90 days mark of no payments. The score will help banks monitor their loan portfolios," says Samir Bhatia, managing director and chief executive officer, Equifax. What makes the score: The risk score assigned to customers will be based on more than 600 variables such as past credit payment history, current credit activity, number of credit cards, number of secured and unsecured loans and demographic variables such as address, income and the like. The score will vary between 1 and 999. Higher the score, more credit worthy the customer is and vice versa. Who can get the score: The risk score is not only available for the existing borrowers who have a credit history, but also for those who have never borrowed. So, even if you’ve never borrowed, you can get a score based on enquiry parameters such as demographic attributes. Banks can use the risk score to validate a new borrower’s repayment ability. Cost: A single report along with the score will cost ₹ 400. However, if you would like to monitor it throughout the year, the bureau will give it to you four times a year for an annual fee of ₹ 1,000. The report would reach you in around 10 business days. You can get more information on the report at www.equifax.in. The Cibil score is a three-digit number ranging between 300 and 900. Like the risk score, it helps in estimating the likelihood of loan repayments. A score closer to 900 indicates that a borrower is least likely to default. The credit report along with the score costs ₹ 450. If you chose to access it online, you would get it in two days, while offline mode would take around 10-12 days. The fact that there is more than one score works in your favour. Says V.K. Kulkarni of Abhay Credit Counselling, “If scores from both the bureaus are high, it will work for consumers. If you have a high score, banks will want you as a borrower and processing time of the loan will be lower." In fact, some banks have an internal policy wherein they do not consider loan for individuals below certain credit scores. If you have a high score with both bureaus, it will certainly help. It may be possible that you are a good borrower and still have a poor score from one rater due to reasons beyond your control. In such a case, a second score will help. Says Bhatia, “when banks will pull out a second score and see a strong one, the consumer may benefit from it." 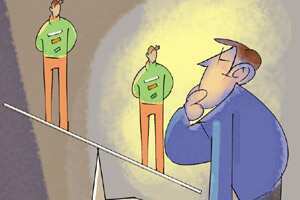 “Generally banks would take a mean of both the scores and decide upon your credit worthiness. Some banks would take the lower score while other bank will take into account the higher score. It would vary from bank to bank," adds Bhatia. Also, having two good scores can help you bargain with the lender in the future. In many developed countries, a high score can be used to bargain for a lower rate from banks. A low score will indicate a poor credit report which will help you detect any fraudulent activity that may have been carried out in your name. If you have not defaulted but receive a low score, you can get in touch with the credit bureau and/or the institution from where the loan was availed for further assistance. Hence, having another rater works in your favour. Also keep in mind, no lender can request to see your credit report without your consent. Usually consent to check your credit report is part of your loan application form. If you haven’t applied for a loan and the report shows that a lender has made an enquiry, there is a good possibility that you may have been exposed to some kind of an identity theft attempt. In such a case, get in touch with the bank immediately. The concept of monitoring credit score hasn’t caught up in India but is common in developed nations. Says Rusi Thavadia, a resident of Detroit, US, “US doesn’t have a savings culture. Everyone borrows, hence credit score becomes important when borrowing. Here, many financially sound individuals monitor their own credit history frequently." Internationally, there are multiple credit scores available from various credit bureaus. Says Mohan Jayaraman, managing director, Experian Credit Information, “we will in a short time provide credit score as an overall consumer proposition." Even as the Indian market mature to the multiple score system, it will be a win–win situation for both lenders as well as borrowers.